"We got trouble right here in River City, with a capital T that rhymes with C and that stands for CHASE"
by Richard F. Kessler, esq. Who Gets a Free House? Wise King Solomon, of biblical fame, was called upon to act as judge and jury before two women who each claimed to be the biological mother of the same infant. He first sought to determine which of the women was the true mother but he could not. He finally decreed that the baby would be cut in half and shared between them. Since 2008, thousands of homes in Santa Barbara county, and millions of homes in California and throughout the country, have been taken by the big banks. Unlike Solomon, the courts have not sought to determine who is the true owner, mainly due to their concern that the homeowner not get a 'free house'. The truth is, that as between the homeowner and the foreclosing bank, one will get a so-called free house. From the point of view of Public Policy and the best interests of our civil society, which should it be? 1. In the early years since 2000, the federal government actively promoted home ownership, encouraging banks to enter mortgage agreements with just about anyone. The banks and mortgage companies then hired people off the street to act as brokers and bring in customers. They abandoned customary loan application, appraisal and underwriting procedures and even added false information to these processes to make the customers look more financially desirable. In this way millions of mortgage transactions were entered by unwitting homeowners who were unaware and not informed by the banks that they had changed the rules. The usual contract provisions were not followed and most of these mortgage transactions could be declared legally void. 2. Through these mortgages, 2.4 trillion dollars of new money was issued by the privately held Federal Reserve between 2000 and 2008. No banks loaned any of their existing funds, rather this money was created out of thin air based on the homeowners' promise to 'repay' it. But the money to pay the interest on that money was not created. When the big banks stopped issuing mortgages and 'loaning' money, the money to repay the original 'loans' dried up. The banks raised the interest rates, people began losing their jobs and suddenly they could not meet their supposed obligation to repay. 3. The banks deliberately set up these mortgages to fail and they took out insurance to cover the inevitable defaults. The payouts more than covered the declared value of the original mortgages; in fact there have been cases of payouts on a given mortgage up to 20 times its original value. These payouts caused the insuring companies to fail, and they were in turn bailed out by the federal government and the Federal Reserve. Since these banks also acted as insurers, they were bailed out as well. This created even more windfall profits. The banks had no money in the game, yet they recouped vast profit off these mortgages. 4. After receiving the green light from the Federal Reserve (so-called warehouse financing) to fund the mortgages, title companies were instructed to photocopy the original Notes and forward them to the Federal Reserve. A stamp stating that the title company "certifies this is a true and correct copy of the original" was placed on the copies which were then forwarded to the bank pretender lenders. It is these copies that formed the base of all future transactions. Since money is made every time a 'note' changes hands, the banks sold these back and forth between themselves as fast and as often as they could. They did this so quickly and so often that the title recordings were not respected, thus creating the situation of breaks in the chain of title, with which homeowners and title companies have been left to grapple. Were a homeowner to pay off the mortgage today, no full reconveyance would be possible because this process involves not only the filing of a Reconveyance on the homeowner's title, but also the return of the original note and deed of trust to the homeowner. These no longer exist. 5. In seeking to foreclose, the banks have dealt with these chain of title issues by manufacturing forged documents, false assignments and intimidating people into capitulating to the banks' demands. They have created the myth of the deadbeat homeowner, a story apparently accepted almost unquestioningly by the courts. On the homeowners' side, many may have committed to mortgages that appeared risky (if it seems too good to believe, it probably is). Perhaps even where the banks offered these mortgages, the homeowners could have declined them. None of us is perfect. However, does this justify the banks' actions - or the courts? Another argument raised by the banks is that since the homeowners accepted the money, they should pay it back. However, is this still true where the 'loan' has already been paid off and the true creditor is unknown? Furthermore, what about other, non-monetary benefits? Who will better steward the land - the banks or the homeowners? Who will better contribute to the health of the community, to volunteer efforts, to caring for the young, sick and elderly, and for the infrastructure of the community itself? What value do these benefits have? This theft on the part of the big banks has reached such monumental proportions that it is becoming a social justice issue and an issue of public policy. There are so many foreclosures, with all the attendant upsetting factors, that it is affecting the stability of our civil society. More and more people have less and less money, including local government. The social consequences of the uprooting of millions of people disproportionately affects women and children. What, second only to her children, takes priority in the mind of every woman? Her home. Millions of homes being foreclosed is an assault on the women and families of this country at a time when women are being physically assaulted in growing numbers and socially assaulted by big government policy. What we are seeing now is an enormous land grab. The big banks' plan is to return the people of this country to feudalism. They will own all the land and we will be the serfs toiling to serve them. Is this truly the direction we the people choose to go? Individual landowners are much more likely to maintain their homes and respect the land, creating a solid foundation upon which a healthy society can build. Some brave families have fought back and sued the bank that is seeking to foreclose. In most of these cases to date the courts have allowed the bank to take properties without demanding the bank prove its entitlement to do so. The truth is, that between the contesting homeowner and the foreclosing bank, one or the other is going to get a "free house"; one or the other is going to get the baby. It would be so simple for the courts to require in a contested foreclosure that both parties come armed with their entitlement documents; homeowners with their Grant Deeds, lawyers for the banks with the original Note and Deed of Trust. Then the King Solomons of today's world would not have difficulty deciding on the fate of most homes. Upon hearing King Solomon's decision, one of the women cried out, begging that the mighty king give the baby to the other woman, in order to save its life. In this way the king determined that she was the true mother. Courts can easily determine who is best entitled to maintain control of residential properties. It is not necessary to divide homes in half. We can overcome the pettiness of the "free house" argument and, for the sake of healthy people in communities everywhere in this country, enable people to stay in their homes. The banks have been paid enough already. Last month I participated in a demonstration under the Santa Barbara courthouse arch to highlight the taking of homeowners' properties at the hands of illegal auctioneers. We were also supporting a simultaneous rally in Sacramento seeking a moratorium on foreclosures in California. During the previous year, assisted by two companions, I had carried on a silent vigil in that same place every Wednesday, holding a banner that read: Another Foreclosure brought to you by The Banksters. This time, reporters from various print media greeted us. I was interviewed and each time I was asked the same question: why do you say what the big banks are doing is wrong, when we are told that the property owners have stopped paying their mortgages? The ultimate answer is that these mortgages have been paid. All the relevant parties, except the landowners, have been made whole. Payment has been made through the sale of mortgage notes, recovery on Credit Default Swaps and government bail out/taxpayer funds. However, to answer this question effectively we need to look into the nature of current money creation as well as the myths devised to keep us from seeing the truth. I buy a car and start making monthly payments. Then my parents pay off the rest. The car dealer does not come after me for payment. The purchase contract has been met. The obligation has been satisfied. Every mortgage contract I have seen reads: "Upon payment of all sums secured by this Security Instrument, Lender shall request Trustee to reconvey the property..." (covenant 23 of the Deed of Trust). These contracts - written by the banks, not the homeowners - recognize that once the obligation has been met, the contract is complete and the homeowner owns the property clear of the mortgage lien. How have these mortgages been paid and the mortgagor obligation satisfied? Starting in the 1980's, financial laws were altered, not by lawyers and legislators, but by bankers. The legal shenanigans culminated in 1999 with the repeal of the Glass-Steagall Act, a Depression era law that had created a firewall between the commercial (money-lending) banks and the investment banks. With this prohibition lifted, the bankers were enabled to share their expertise and devise money-making schemes unavailable to them previously. Certain big banks (the ones we have come to call the too-big-to-fail banks) developed a plan to monetize mortgage payments, which they then securitized and marketed to investors. Note that these banks marketed only the monthly mortgage payments, not a security interest in property. Yet the price of these investments covered the total cost of the original mortgages. Monies from these investments was one way these banks recouped the alleged cost of the mortgages. In order to follow their plan to make the big money, the bankers needed mortgages - lots of them - any signed mortgage would do. They paid brokers huge sums to find mortgagors who would sign impossible mortgage documents after being led to believe their homes would continue to increase in value and their money-earning capacity was secure. The banks relaxed underwriting standards. They tied the interest rates of these mortgages to the LIBOR index, which they then manipulated to increase their profits, knowingly causing the rates to become too high for mortgagors to meet. These banks lured institutional investors (such as pension funds) into investing in these mortgage backed securities by promising incredible returns and providing AAA rated securities for purchase. This approach might have been acceptable if all parties had been notified of the banks' intentions, but they weren't. In a fair world, mortgagors whose payments were being used to generate profits for the banks would have been given a part in the deal. Instead they were led to believe it was mortgage business as usual, while investors were misled as to the stability of the mortgage payments which were the return on their investment. The only parties which knew that mortgage payments would quickly become unstable were these same banks: Chase, Bank of America, Citi, Wells Fargo, Goldman Sachs and a few others; the international banks in this country. They witnessed the simultaneous transfer of funds offshore due to the outsourcing of jobs in the manufacturing and service sectors of the economy. They knew the money bubble they created was going to burst, as more and more people would lose their jobs to overseas workers. How did these banks create a money bubble? The answer lies in the true nature and functioning of the Federal Reserve, a privately owned corporation beholden only to its shareholders (of which Chase is the largest institutional investor). It has a monopoly on money, on both its issuance and its distribution. National laws have been passed making it illegal to meet financial obligations in other than federal reserve (central bank) notes. This entity has taken control of the federal government and, through its subsidiaries - the central banks of almost every country on the planet - it masterminds and manipulates the world of money. How is this money created? Due to the nature of its financial structure, money comes into being only when people are willing to borrow money from the banks and pay it back with interest. Money is printed according to demand. Once the money has entered into circulation, it then changes into a commodity that can be borrowed and loaned. Borrowing money from a friend is not the same thing as taking a “loan” from a big bank. In the first case the debt-money has been quantified and there exists an obligation to repay it. In the second, we are actually doing the big bank a favor by repaying them something they created out of thin air at no cost to them, and with interest on top of that. By taking out a mortgage, mortgagors create the money, based on their own promise to repay it. Once that pledge has been made, the big banks literally materialize the money out of nothing and transfer the homeowners' credit back to them. This money does not come from within the banks' actual holdings: the homeowner's promise really creates the money. Every mortgage note begins with the same words: "In return for a loan that I have received." However, this is a lie. The funds are not delivered until at least a week after the mortgagor has signed the note. It takes that long to transfer the signed note from the so-called "lender" to the Federal Reserve and to receive the "funds" back. There is no lender. There is nothing loaned. It is all created out of thin air. The more mortgages issued, the more money created. Between 2000 and 2008, 2.4 trillion dollars were issued by the big banks, mostly through mortgages. But the money to pay the interest on that money was not created. When the big banks stopped issuing mortgages and "loaning" money, the money to repay the original "loans" dried up. The banks raised the interest rates, people began losing their jobs to overseas workers and suddenly they could not meet their supposed obligation to repay. The bubble burst. The banks knew this was going to happen - that was their plan. So they created Derivatives, a kind of insurance as a protection against failure, except that there are no limits as to what or how many derivatives can be purchased and by whom or covering what. Derivatives are completely unregulated. It has been estimated that the total "value" of derivatives far exceeds the net worth of everything on the planet. These banks claim value in these derivatives and use them to increase the declared value of their assets. They purchased derivatives, called Credit Default Swaps, on the mortgage-backed securities they created, knowing they would fail - they were created to fail! - and have benefited enormously at the expense of the homeowners, renters and investors. The payout on these derivatives more than covered the cost of the original mortgages. There have been cases of payouts on a given mortgage up to 20 times its original value. The banks have no money in the game, yet they recoup vast profit off these mortgages. Then they assert their right to take properties they declare in default. These banks still seek a free house after receiving that kind of profit! The principal issuer of derivatives was AIG. In 2008, as the mortgage-backed securities were failing, there was such a run on AIG to pay up on these derivatives that this company was "bailed out" by the government, as were most of the big international banks. In this way all taxpayers have ended up paying off the mortgages. And from then on these banks have grown enormously in size and power, as the rest of us and the economy have fallen into financial desperation. What started out as predatory lending has become predatory conquest. These banks have taken over more and more small banks. With their unconscionable sums of money, they have been able to buy Congress, effectively neutralizing any viable opposition other than We the People. They now control the mainstream media and the education curriculum. Education is supposed to be a matter of State control. However, we now have a Federal Secretary of Education and the Federal government uses its financial power to influence curriculum throughout the country. These banks are behind the Federal government. That means they now control how and what we think. Over time, as these banks plotted ways to conquer the country, they focused on creating certain mythologies that they have used to manipulate the citizenry. One is the myth of the self-made man: the rugged individualist who firmly believes he alone created his own success and therefore has no need to help others or even empathize with them. In fact, no one can succeed completely on their own, yet we have been brainwashed into thinking we should. The genius of this myth is it prevents people from moving into community. There are more We the People than there are bankers, but a people divided is easier to control. A second example of deliberately created myth is the fervent patriotic belief that the Federal government supports the people and would never do anything to betray them. The government tested this myth in 2001 with the tragedy of the World Trade Center. The failure of public opinion ( as reported by the controlled mainstream media) to challenge the belief in the infallibility of the central government, has emboldened those behind the government to undertake ever increasing criminal activity. This faction operates through Doublespeak. They leave their mark in things like the Patriot Act, Homeland Security, Monsanto, health insurance, conspiracy theory, Federal Reserve. A similar belief, concerning the infallibility of the banks - the myth of the trusted banker and his stalwart support for his community - seems to be losing its hold. Yet another myth is that of the deadbeat homeowner. The media, the government, the courts and the big banks seek to lay the blame for mortgage and economic failure on individual homeowners. The wall of shame that has been created is almost impenetrable. People feel isolated, afraid, convinced of their own wrongdoing and that they have an obligation to repay, not realizing the money would never have existed without them. They are ridiculed, made to feel wrong and then are evicted from their homes, when the act of their living in homes is actually the basis of a stable civil society. The law states that a mortgage is a contract. Yet these securitized transactions did not follow the prescribed rules of contract formation. In truth, there is no mortgage contract, no party to the contract who is owed money and any money received by the homeowner is the result of a legal fiction. These mortgages were set up to fail because that is how the bank middlemen satisfied their greed. Why did they do it? Because they could. I imagine a scenario where eight or so men were playing golf. They had already come up with a plan to siphon off all the money their bank, the privately owned Federal Reserve, had issued. But that wasn't enough. They needed a further challenge. One of them came up with the idea of acquiring all the land of the planet as well. They decided they wanted to own the Earth. What we are seeing now is an enormous land grab. They created a scheme where people were encouraged to acquire property, they set the acquisitions up to fail, they created a myth that the homeowners themselves were greedy and deserved to be punished, and they stole the properties. The general public is only now beginning to wake up to the fact that it is the banks and not the homeowners who are immoral. Over a tenth of the homes in this country have already been taken in this way. The bankers did the same thing to family farms during the Depression and ended up creating agribusiness and Monsanto. Now their plan is to return us to feudalism. They will own all the land and we will be the serfs toiling to serve them. Is this what we want? Do we choose a world where the big banks own and control everything, or a world where we can all live in harmony and community? Are we not ultimately in this together? I am my brother's keeper because we are one family. The tragedy of the dispossessed homeowner is an event which affects us all. Instead of casting aspersions and dividing our community, could we begin to come together in unity? Ultimately this is a social justice issue. Let us stop foreclosures now. The author, Margaret Carswell, has an undergraduate degree in sociology, and law degrees from McGill Law School in Montreal. 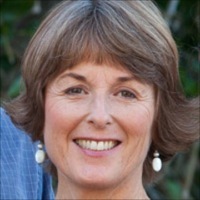 She raised three children and is a proponent of Waldorf education. Upon being diagnosed with leukemia in 2004, she ruthlessly investigated, and then changed, her beliefs and lifestyle. Her website, EarthFirstConstruction.org, was created as a result. When Chase subsumed Washington Mutual bank in an overnight coup in September 2008, she began investigating big bank fraud and the corrupt monetary system bolstering these banks. This editorial is born of that ongoing investigation. She is completing research for her new work entitled, A New Wa of Living: creating a blueprint for a new society beyond the current monetary system. Margaret Carswell lives in Santa Barbara on Earth First Farm. Download a copy of "Deadbeat Homeowner". There are times in life when we are called upon to stand up and speak our truth. Now is one of those times for me. I feel outraged at the total disregard the Big Banks have shown concerning the emotional and economic devastation they have created in this country and the effects their actions have had on American life. They set the system up to fail. They cannot now be allowed to benefit from their own wrongdoing. Viewed from our present vantage point in 2010, it is clear that, starting about ten years ago, in the mortgage banking industry, there occurred a sea change, of which we consumers were unaware. The investment bankers began soliciting the mortgage bankers, bringing with them their particular approach to investing, as they were accustomed to doing concerning stocks, bonds and futures trading. They convinced the mortgage bankers that almost instant megabucks were to be had through trading in securitized mortgages - any mortgages, but especially those they set up to fail through various fraudulent activities, by secretly betting that the individual mortgage backed securities would devalue. We grew up knowing that the local banker was our friend and, through partnership with the bank, many people achieved homeownership and the peace and stability in our communities such ownership brings. This is no more. We have heard much recently in the media about the wrongdoings of these Banksters; the obscene profits they have made, their unrepentant attitude, the effects their behavior has had, not only on failed pension funds, but also on major countries such as Iceland and Greece. What has been less talked about is how their behavior has affected individual homeowners. As these new activities of the Banksters come to light, it is obvious that they have failed to honor the intention of mortgage contracts - indeed they never intended to fulfill their mortgage obligations to begin with! There are several causes of action that come to mind here: breach of common law contract, racketeering under the RICO laws, conspiring to defraud the American people, in addition to numerous statutory violations. I prepared a visual presentation and submitted it as an offer of proof to District Court Judge George Wu on January 28, 2011. He dismissed my complaint against Chase, and I appealed to the 9th Circuit Court of Appeal. You can download and view the presentation by clicking on the pdf icon. Pleadings can be viewed in the cases and pleadings section. More about my case below. In this memo, I describe my personal life experience and then show how the bank, Washington Mutual in this instance, failed to meet the common law criteria relating to the formation of a lawful contract. 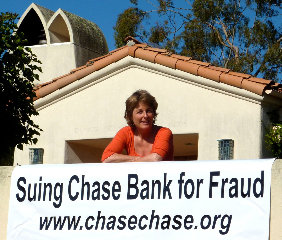 Following this, I show how Chase, in its various configurations including its division called California Reconveyance, has no moral right to use goon-like tactics to intimidate people and no legal right to foreclose on their property. On behalf of the American people, I am seeking to use the courts to redress the wrongs perpetrated here. If there is no recourse through the legal system, it will surely come on the streets. My story unfolds against the backdrop of the huge betrayal I received from the divorce courts and the abandonment at the hands of my children's father. So I start there and then move into the current mortgage situation, as it slowly began to dawn on me that things were somehow different this time, compared to previous mortgage situations. I met my husband in 1978 in the Canadian Arctic, where I went to practise law and where he had started a small charter airline a decade earlier. During the next 14 years we grew that business into the largest regional passenger and charter airline in the Arctic, and together had three children. We became very wealthy and acquired several residences and related material possessions. Our main home was in Santa Barbara, where the children attended school. In 1992 I was served with divorce papers. The divorce culminated in August 2005 with the Santa Barbara court decreeing (no reasons given), that I would receive no spousal support, and in January 2006, when the court in the Canadian Arctic declined to order a division of our property. This had the effect of disenfranchising me of access to any property I had brought into the marriage, as well as my just share of our acquired assets. After my husband filed for divorce and my young children and I were evicted from our Santa Barbara home, I designed and built (financed by a series of five mortgages) the home where I currently live. As a result of the courts' decisions, my home is the only material possession I still have. In 2006 this property was subject to a $1,200,000 mortgage. Illness, brought on by the stress of the divorce, prevented me from being able to maintain paying employment. In June of that year I had a nervous breakdown, caused by the sheer angst of not knowing how to extricate myself from the financial mess in which I found myself. In July I was introduced to a mortgage broker named Robert Waldman, out of San Diego. I liked him immediately. He gave me a book to study, entitled Missed Fortune 101 and over the next few months, convinced me to obtain a $2,500,000 mortgage from Washington Mutual. In early December he drove up to Santa Barbara and had me sign a loan application, which was later submitted to WaMu. During this same time I was shopping around, courting two other brokers, one for World Savings and the other, Countrywide. In the end I chose to go with WaMu, partly because I had had a mortgage with them before that had worked out well, and partly because of their reputation of not selling off their loans but rather, keeping them in-house. The mortgage documents were signed by me on December 20, 2006, at my home, alone with a notary, four days after the sudden death of my mother. After the signing, the notary took all the documents with him, telling me the bank or the title company would forward the finalized documents to me. I was startled at this, as the procedure had been quite different in previous signings. Nevertheless, this mortgage paid off the existing mortgage (which was with Chase Bank) and gave me the funds to start rebuilding my life. I have slowly but surely been pulling myself up by the bootstraps ever since. I did not enter this mortgage loan blindly; I came up with a plan for how to repay the mortgage. The plan had four parts. The first was to remodel the "sunroom" of my home and turn it into the prototype Self-Healing Clinic, in order to continue my business there and to serve as the example to potential donors to our non-profit corporation, Earth First Construction and its adjunct, the Self-Healing Education Center. The second was to remodel the back bedroom suite of my home to prepare it for hosting paying guests. These remodels have been done. The third was to take the actual cash I received and invest it. This has also been done. The fourth was to reduce my living expenses as much as I could. I have observed that what is good for my pocket book and for my own health is also good for the planet. Living frugally has caused me to stop heating my house and start hanging my clothes outside to dry. This also led to the idea of Earth First Farm, a self-sufficient urban organic farm which I intend to have operational here on my land by the end of 2010. And it led to my loan modification proposal. In January 2009, knowing of the acquisition of Washington Mutual by Chase bank and assuming that Chase had taken over the mortgage, I contacted Chase with a proposed loan modification. The bank cashed each monthly payment I made for the first six months and then I opened a bank account at Chase bank, informed them I was doing this and granted them permission to withdraw the monthly payment from there. I never missed a payment, nor was I late with a payment. I have no other debt. In order to reassure myself that opening the bank account was a correct way to go, I went to consult the head broker in Santa Barbara for Chase Home Finance. To prepare myself for that visit, I had searched my own mortgage file and found the only thing it contained was a copy of the closing statement with the title company, Alliance Title. I realized I had never received the promised copies of the mortgage documents I signed almost three years earlier. I remembered having asked the broker, Mr. Waldman about this a few times. He assured me I would receive the documents and not to worry. Eventually I forgot about it. The man from Chase Home Finance and I together called the number on the closing statement for Alliance Title, only to learn that it had gone out of business. Together we called the successor company to Alliance who told us they did not have any knowledge of this mortgage, much less any related documents. In early October, a man who identified himself as a real estate agent, showed up at my front door. He informed me that a Notice of Default had been filed on my property title. To my great surprise I learned that a Notice had indeed been filed, on September 2, 2009. In mid October, Robert Waldman and I called the phone number listed on the NOD and eventually spoke to someone at Chase bank. We requested of her the loan application, note of mortgage and deed of trust. We were assured that the documents would be mailed out to me the following Friday. The only thing I did receive (along with a note indicating the documents I had requested were enclosed), was an appraisal of my property, done on behalf of Countrywide bank! Mr. Waldman had used a private appraiser to do the appraisal that was submitted to WaMu. In mid November I went to the County Recorder's Office to obtain all the relevant documents on title. I discovered an Assignment of Deed of Trust, filed at the same time as the NOD, indicating that the beneficial interest under the Deed of Trust had apparently been assigned to Bank of America National Association. In addition, I went to see a real estate lawyer, David Grokenberger. His office tried over several weeks to obtain the same mortgage documents I requested of Chase in October. His office also sent out a letter to the Trustee requesting a voluntary six-week stay under the NOD in order for us to review some questionable issues concerning the bank. There has never been a response. So finally we came up with a plan. I would buy the time necessary to complete my research concerning Chase bank and my original loan, by paying under protest to reinstate the loan, and then I would stop making payments altogether. After trying for three days, I finally received the quote to reinstate. The second time I called the bank to request the payoff amount, I spoke to "PJ" who, in the course of the telephone conversation, told me in an annoyed voice, that I was not going to repay the money so why was she even giving me the quote. Without me asking, she then informed me that a date of December 23 had been set to sell off my property. On Monday, November 30, I went to the local Chase bank branch where I had set up the mortgage account and met with the bank manager, Kevin Johnson, to whom I handed the pay-off amount in a cashier's check. He sent the payment via FedEx to the appropriate bank department. However, on December 3, 2009, I discovered pieces of paper taped to my front door; a notice of trustee's sale slated for Dec 23 at 1pm. On December 10, I called the bank manager and requested that he check to see when Chase would order the removal of the NOD from the title. He called me back to say that Chase had indeed received the money, that it had been processed on December 8 and that it would take a few more days before the bank would request to vacate the title. On December 15, I called California Reconveyance, having first noted that the NOD was still on title. Darlene informed me that the sale date had been set over until January 26, 2010, in order to allow Chase more time to "locate the money". On December 18, I discovered that a notice of trustee sale of my home had been published in the local paper and was slated for the following week. The next morning, I received a phone call from a woman with a heavy accent who said she was calling from Chase Bank. She proceeded to ask me if I was still residing at the targeted property. I asked her why she needed to know. She then asked for my email address. I declined to give it. She then became quite rude and informed me that I owed the bank $57,000, that I would never pay it and that the bank was going to take my home away from me. On Wednesday, December 23, I awoke with the left side of my head completely blocked. I could hear nothing out of that ear. My balance was also affected. That was the day slated for the auction of my home. I decided not to go to the courthouse. Two friends, armed with legal papers, went in my stead. They were informed by the auctioneer that the sale had been cancelled. However the NOD and the notice of trustee sale were still listed in the County records that afternoon. At 9:25 Christmas Eve morning the phone rang and a heavily accented man identified himself as calling from Chase bank as a debt collector. I hung up the phone. I told myself I could handle this intrusion but I found myself becoming very upset. On December 24 a Rescission of Declaration of Default was finally filed with the Recorder, almost a month after I gave Chase the money. I have not received an accounting for the $52,000+ I paid to Chase. I have received harassing phone calls from Chase ever since, sometimes numbering up to six a day. In mid-December, 2009, I began meeting with California attorney Douglas Gillies. He reminded me that a contract cannot be formed under the Common Law unless there is a shared expectation between the parties, or a "meeting of the minds." He said that the banks broke the system when they started making loans to homeowners knowing full well that the borrowers would not be able to make the payments. The end of January 2010 I decided to investigate the Assignment of Deed of Trust by paying a visit, along with my friend Jack Reed, to the bank manager of our local Bank of America, Jason Moumtzoglou We spent about a half hour there. I found out that neither I nor the mortgage is listed within their computer system. The manager stated categorically that Bank of America had no interest in my property. In February, I filed a Notice of Intent to Preserve Interest with the County Recorder's Office. In it I stated that Washington Mutual Bank had had no intention of fulfilling a mortgage agreement with me. I noticed that the Assignment of Deed of Trust contained a reference to WaMu Mortgage Pass-Through Certificates Series 2007-OA1 Trust. In tracking this down, I discovered that my mortgage, which closed on December 28, 2006, had been sold to WaMu Asset Acceptance Corp. on or before January 1, 2007 and placed, through a Pooling and Servicing Agreement, along with 1,908 other mortgages, into a Pass-Through Certificate, a type of security. This was given an AAA rating by both Standard and Poor's and Moody's, then offered as an investment at least twice (through Transamerica Funds PIMCO Total Return and Allianz Global Investors). The CUSIP # for the A1A class, of which my mortgage was a part, is 92926WAA5. By mid-March 2010, I realized that Washington Mutual had sold my mortgage in early 2007 and purportedly assigned the beneficial interest to LaSalle Bank, which was taken over by Bank of America later in 2007. BofA denies any interest in my mortgage. No investor has shown up to claim an interest. So I wrote California Reconveyance (the Trustee named in the Deed of Trust) formally requesting it to file a Full Reconveyance of my property title back to me, as being the only interested party still remaining. Instead, California Reconveyance filed a Notice of Default at the County Recorder's Office on March 31. I went to visit the Santa Barbara County Recorder, Joe Holland, and told him what I had discovered concerning my own dealings and Big Bank Fraud in general. He was aware of events and sympathetic to our cause. About this same time I began to connect with various activist groups around the country. 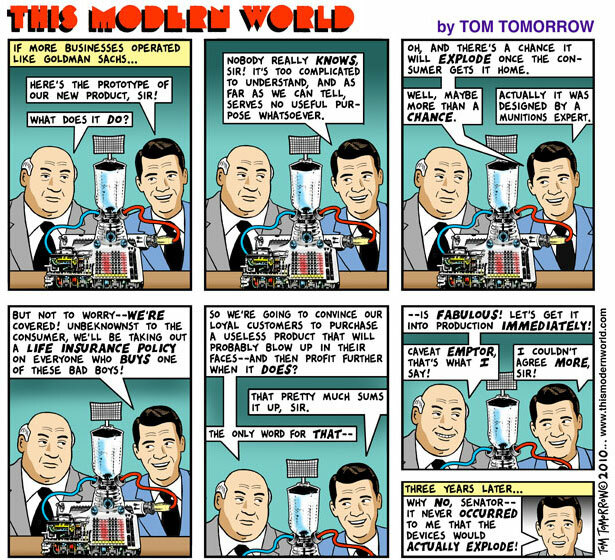 I heard an item on NPR from Planet Money, where they had purchased a toxic asset and were monitoring its demise. I decided to trace the toxic asset containing my mortgage. I read in the Pooling and Servicing Agreement that the Mortgage Loan Schedule, included as Exhibit D had been "intentionally omitted" from the Agreement but that copies could be obtained by requesting them from any of the various banks. I have been tracking down this Schedule as well and recently received an email from Chase declining to send me the document "because it contains sensitive borrower information". At the end of April I sent a Qualified Written Request, pursuant to RESPA, to California Reconveyance and Washington Mutual Bank. I have received an unsigned letter response only from Chase, to whom I did not address the request. In California a mortgage consists of a promissory note and a deed of trust. These, plus the borrowed funds, create the framework of a contract between the lender and the borrower. There are several essential elements to the formation of a valid contract. A mortgage contract consists of an offer to lend money and an acceptance by the borrower in the form of the signed note and deed, where the consideration is the receipt of the funds from the lender to the borrower. Both parties agree that the note and the deed are to be returned to the mortgagor upon full repayment of the borrowed funds. One of the essential ingredients of a valid contract is called mutuality of agreement, otherwise known as a meeting of the minds. In legal Latin terminology this is called consensus ad idem. This ingredient refers to the fact that the contracting parties must be agreeing to the same thing. In a valid contract one party cannot be offering to sell apples while the other thinks they are buying oranges. In mortgages originating between 2001 and 2008, one of the issues has become this question of the meeting of the minds. Did both parties, in creating the contract, have a shared expectation? Where both parties agree that the trust interest will be returned to the borrower upon full payment of the loan, it is then incumbent on both parties to do their best to ensure this result. There is no contract where one party intends to prevent the other party from being able to complete the contractual terms. The way the courts determine whether there has been a meeting of the minds is to inquire into the conduct of the parties. As I mentioned above, I had every intention of repaying the loan. I agreed to pay Washington Mutual bank the money it loaned me, on a monthly basis until the loan was paid off. I fully expected the bank would work with me, and I chose this bank precisely because I had had good dealings with it in the past. Unbeknownst to me, WaMu did not share this same intention this time around. Instead it had discovered that it was far more lucrative to broker the loan to investment banks, after creating a situation which made it impossible for the borrower to repay, and then taking out insurance to cover the certain loss, in addition to taking the property through foreclosure. WaMu cannot have it both ways. It cannot intend for the loan to be repaid and also intend that the loan fail. Since intention is one of the elements essential to the formation of a contract, without mutual intention, or meeting of the minds, there is no contract. A contract that is void from the beginning cannot be an enforceable contract. 1) A notary came to my home unaccompanied and quickly left after the signing, taking ALL the documents with him, making it impossible for me to review them. In the months since I stopped payment I have been slowly receiving purported copies of the mortgage documents. This has enabled me to research what has happened in my case, against the backdrop of information coming to light at the national level concerning the Big Banks' behavior. 2) In reading the final loan application, I discovered that someone other than me added in an arbitrary monetary value for the non-profit corporation I founded, as well as grossly inflating the amount of my monthly income. It used to be, to quote from Missed Fortune 101, that "Most banks are not collateral lenders (even though they love using it as extra security). They loan on your ability to repay. If you lack that ability, they won't lend you the money." It is the underwriters who determine whether a potential borrower has the ability to repay. A letter dating from 2003, from the office of the Comptroller of the Currency, warned, "a departure from fundamental principles of loan underwriting generally forms the basis of abusive lending: lending without a determination that a borrower can reasonably be expected to repay the loan from resources other than the collateral securing the loan, and relying instead on the foreclosure value of the borrower's collateral to recover principal, interest, and fees. A national bank that makes a loan to a consumer based predominantly on the liquidation value of the borrower's collateral, rather than on a determination of the borrower's repayment ability, including current and expected income, current obligations, employment status, and other relevant financial resources, is engaging in a fundamentally unsafe and unsound banking practice that is inconsistent with established lending standards." It used to be that banks determined the future borrower's ability to repay by investigating the criteria set out above. Now the Media describe an industry that routinely failed to perform its due diligence both at the loan underwriting stage as well as in the ratings assessment of mortgage backed securities. Clearly the bank failed to perform its due diligence in underwriting my loan or it would have discovered that the loan application did not reflect the truth. 3) The Adjustable Rate Note, which does not anywhere mention my name and for which the signature page is undated and completely separate from the document, reads in its first section: "In return for a loan that I have received..." The Note carries a date of December 20, 2006. I received no funds until December 28, 2006. 4) The Note is not signed by an officer of the bank nor is it accompanied by a document authorizing the bank to lend funds to me. 5) Information I have since obtained indicates my mortgage was sold to an entity called WaMu Asset Acceptance Corp. and was bundled into a Pass-Through Certificate on or before January 1, 2007. With the bundling of the promissory note into the Pass-Through Certificate, WaMu would have been paid the value of the mortgage note. Given the separation of only three days between the loan funding and its bundling, it is entirely possible that WaMu brokered the loan and never funded it from its own accounts. If it does not matter where WaMu obtained the funds to make the original loan, then it cannot matter where the funds came from to pay it off. If WaMu sold the loan, then the loan was paid off as far as the contract was concerned. It no longer owned the loan and therefore had nothing to bequeath to any successor. 6) With the transfer of "all beneficial interest" to LaSalle Bank, WaMu relinquished its interest in my mortgage. It no longer owned either the note or the deed of trust. While securitization of the mortgage note is not illegal, the act of multiple collateralizations of the same note is highly questionable. These acts all point to the conclusion that WaMu was not looking to me, the borrower, to repay the loan, so much as it was seeking to reap the most profit possible at the expense of the mortgage. 7) Above and beyond the failure to reach a meeting of the minds between Washington Mutual and myself, thus vitiating the contract between us, there is further evidence of wrongdoing here. When one considers the new industry standard of buying Credit Default Swaps as a hedge against the failure of the loans, and the near bankruptcy of AIG, (the main purveyor of these CDS's), given the sheer volume of the swaps that were presented for payment, it is highly likely that the CDO's into which my mortgage were bundled were also protected against their failure. However, by the time these CDO's would have failed, WaMu was no more. It was declared bankrupt on September 24, 2008 and was taken over by JPMorganChase the following day. What Chase paid for WaMu would not have covered the value of WaMu's West coast real estate, much less any future revenues to be garnered from servicing WaMu's loans. Because Chase is claiming ownership of WaMu's outstanding loans, it will have received the proceeds from any Credit Default Swaps, in addition to the millions of homes it has placed into foreclosure and sold. This includes presumably, the proceeds from the two notices of default filed on my property title. There is clearly evidence here of unjust enrichment to Chase. 8) Chase, employing mafia-like tactics of harassment, intimidation and threats, has sought to coerce WaMu borrowers in general and me in particular, into handing over the loan monies to the bank. It does not own my loan and never did, because WaMu had already sold it. This coercive behavior is oppressive and must be stopped. 9) Chase has no right to foreclose on my mortgage. This raises the issue of legal protection for California consumers. Is it possible that the enabling California legislation referring to mortgage default and nonjudicial foreclosure is unconstitutional as depriving individuals of their Due Process? The Banksters are being allowed to devastate our personal lives without first obtaining judicial review to do so. 10) Chase bank does not own my mortgage. In the copy of the promissory note sent to me, it states that only the note holder may foreclose on a mortgage. Especially in a state such as California, where a foreclosure can happen without any judicial oversight, it is imperative that the usual checks and balances be adhered to. Chase has no right to foreclose on my property because it has no ownership right to my property and no legal relationship to me. Therefore I have requested of California Reconveyance that it reconvey the deed of trust to me. 1) There was never a contract to begin with and there is no aggrieved party left, except me who is being harassed by a bank that has no legal claim to my property, and (possibly) undetermined investors who would have lost money when the mutual funds they (or their pension funds) invested in, lost money because the CDO's in which the mutual funds invested (lured by AAA ratings) failed. The other big loser is the American Public because the "bail-out funds" handed to the perpetrators of this huge fraudulent crime, the Big Banks, have never been distributed to their customers. Whatever happened to the anti-trust, anti-monopoly laws? In healthy capitalism, many companies are supposed to vie for the consumers' business, instead of colluding in order to extort from the consumer their very last penny. It appears that a handful of too large not to fail banks has taken over the mortgage industry and held it hostage to greed mongering. This must be stopped. I am asking for further help from you, dear readers. I am seeking introduction to an investment banker who is knowledgeable about the inner workings of the investment banks and their handling of mortgage backed securities. I also require further evidence of collateralization of my loan and proof that Credit Default Swaps were placed on those Collateral Debt Obligations and whether payments have been made pursuant to them. I need the CUSIP# for the individual WaMu mortgage loan number 3013137207 so that I can trace it into other CDOs in which it might have been placed. Further suggestions or advice from you who have just read this would be much appreciated. 3) For the past year and a half my focus has been on turning my property, "Earth First Farm", into an urban organic self-sustainable farm. I am the President and CEO of Earth First Construction, a California non-profit corporation, which I created in 1992. We are at the point of finalizing the first step of our vision, which is to become independent in terms of water, energy and food. We intend to have the ground ready to begin planting this coming winter, having upgraded our greywater system. We have located water for a well, are at the point of installing the solar and building the blackwater system. Our vision is to do this as a community project, to be a showcase of sustainability to inspire and assist others to become more resourceful as well. I am continuing with my work of creating Earth First Farm, even as this action looms over my head. This property is my business and my life. 3) to assist in the demise of the Banksters and the monetary system on which they depend. I would first like to honor the role that Washington Mutual bank has played in my life and express my gratitude and appreciation for this company's assistance. I believe it is possible I would not be alive today if WaMu had not passed on to me the funds it received in return for monetizing my promissory note at the end of 2006. This was a desperate time for me, having at the beginning of the year experienced the shock of final decisions in a brutal 14-year divorce which left me sapped of life force, missing body parts, diagnosed with leukemia, extremely depressed and penniless. I was only beginning to recover from the consequent nervous breakdown I suffered mid year and at the time of the signing I was also dealing with the sudden, unexpected and immense loss of my beloved Mother and best friend. I will be forever grateful that this bank enabled me to start the process of recreating my life such that today I am in the position to serve humanity as I am doing here. I owe WaMu a tremendous debt of gratitude. It is unfortunate that insatiable greed infected this bank in its final few years and caused the demise of a long-living and venerable institution. On July 14th, Bastille Day, I chose to file a Complaint against Chase bank in Federal Court Los Angeles. What else could I do? I had already tried to file a Reconveyance of my title back to myself, but the Recorder's Office had refused to accept it. I then requested that the so-called "trustee", California Reconveyance, file the Reconveyance, but their response was the Notice of Default. They clearly take their walking orders from Chase bank and do not behave at all like a trustee. Chase immediately filed a Motion to Dismiss my lawsuit, as they seem to do in every case like mine. The court hearing on this is next week. However their actions have allowed me to file a Response in which Douglas Gillies and I worked hard to focus and clarify our issues even more. I am grateful to have been given this opportunity. So who is the mortgagee? Time and time again I have asked Chase to provide the documents necessary to prove that it is the mortgagee. I receive only drivel. I am convinced now that Chase is not the mortgagee and has no right to take possession of my property. But how to stop them? Every day of the week I do my research. I watch as the number of foreclosures reaches record levels and the government does nothing. I network with people all over the country who feel as frustrated as I do. I feel the inequity in my soul. In the meantime, through my research, I have obtained the famous "Exhibit D" to the Pooling and Servicing Agreement. My mortgage is indeed in there, along with 13 other Santa Barbara properties, out of the 1,909 included in the tranche. So I can prove that my mortgage was securitized through the Pooling Agreement. In addition to the various portfolios I have found that market the security in which my mortgage was placed, I was actually able to trace one portfolio to real people investors and talk by phone with them! I was afraid they might be angry at me, but, quite the contrary, they were polite and helpful. Turns out the investment company which prepared the portfolio in question, managed to convince this government retirement fund investor to also purchase tail risk insurance, just in case the portfolio securities turned sour. And the kicker is that the suggested insurance company, and the one the retirement fund went with, is affiliated with the investment company. Conflicts of interest all over the place. However, the investors are happy because they are convinced they will not lose their initial investment, even if they never receive any return on that investment. I have also received information indicating, as I have suspected for some time, that my mortgage was securitized individually, outside of the Pooling Agreement. As such, it has been pooled into another security and is being marketed in Europe. I wonder how many other times it has been securitized? A few weeks after I filed the lawsuit, I commissioned a banner which hangs outside my house. A photo of me and the banner appears elsewhere on this website. As a result of hanging the banner, a newspaper article was published a month ago about me and my case. This in turn has elicited interest from various people who have sought me out, so that I am now working on the mortgage issues of other people as well as my own. In November, I will speak in a local church parish hall with a PowerPoint presentation dealing with what I have learned about mortgage fraud. x One huge gift I have received as a result of this Big Bank Fraud is the certainty that I am now doing the work I was born to do: to assist in the demise of a worldwide economic, political and social system that no longer functions. I feel clear and on track. That is the caterpillar part of my work. I do miss the butterfly part however. I can only focus on Earth First Farm in my spare time. Nonetheless, the first series of solar panels was installed in May. I feel pleased with how well they function. The overall permaculture plan for the farm was presented in August and we are slowly but surely implementing it. I am in the process of having printed in booklet form a series of articles I researched and wrote over a year ago, entitled "Happy People, A Better World: How to Get from Here to There." Shelter is one of the essential elements in life, in addition to food, water, and human contact. What is shelter? It is our homes. And because our homes are essential, the banks are able to mess with those of us in loan modification hell to the point that we become physically ill. I have read about it, and I have experienced it. The gut-wrenching fear is present almost constantly some days. Most of the people I know who are in loan modification hell are on anti-stress meds. We are smart people, loving people, compassionate people, and the banks are brutally assaulting our very souls. I know that's strong, but its how I feel and what I know. I know people in this nightmare who throw up many mornings because of the stress. I know people whose chronic illnesses have increased, and who are often too tired to drag themselves out of bed. I know that couples fight, that marriages are threatened, and that people are just overcome with disbelief. And yet it continues. I worry about the people who are at their wits end. How in the world are they ever going to fight the banks if they are so scared - so almost paralyzed with fear that they will lose? Most people have no ONE person at the bank they can talk to. It's the luck of the draw who you will get on the other end of that line when you call that bank, and I know first hand that no matter how prepared you think you are, that person can reduce you to a puddle with their cruelty. I often fantasize about a class action lawsuit against Wall Street. Not about the loan mods (although that is a fantasy at other times), but one that is due to the personal damages and stress and health care costs that we have all incurred because of this nightmare. Ah, that is something that might happen in another dimension, unfortunately. The America I now know now does not care about much about anything more than money and power. It is sad, isn't it?